Soldiers from the 1st Brigade, 82nd Airborne Division, part of the Army’s Global Response Force, exchange situational awareness with a geographically separated location using this interim capability Tropo Lite system during an expeditionary network demonstration at Fort Bragg, N.C., March 9, 2016. With this Tropo Lite, Soldiers can bounce (or scatter) signals off of the troposphere much like skipping a stone on pond, or they can refract signals off of objects such as mountain tops, extending signals over terrain obstructions like trees and mountains, which can inhibit LOS communications. Photo Credit: Amy Walker, PEO C3T Public Affairs. Suppose you are supporting an early entry Global Response Force (GRF) mission; which network equipment would you rather fly in with: two large sheltered vehicles that take up critical cargo space in your C-17 aircraft, or a few carry-on transit cases that provide 12 times the bandwidth? Continuing to inform requirements and seek solutions for light-weight, expeditionary networking gear for the GRF, the Army recently demonstrated a new modular suite of expeditionary communication equipment that provides increased bandwidth with significant size, weight and power (SWaP) reductions. 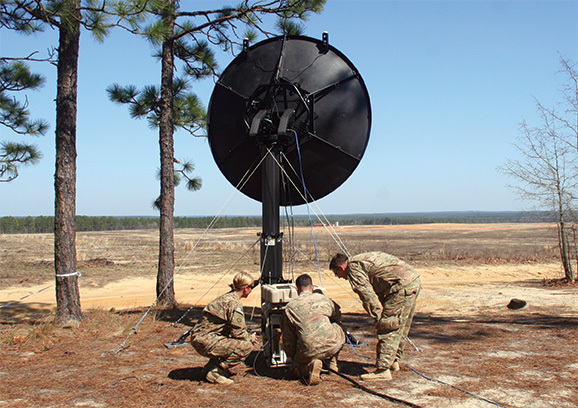 The Army conducted the operational proof-of-concept expeditionary Signal Modernization (SigMod) capability demonstration at Fort Bragg, North Carolina, in mid-March, in support of the current 82nd Airborne Division operational needs statement requirements. Soldiers from the 127th Engineering Battalion, 82nd Airborne Division, executed the demonstration at three geographically separated locations to see how these new scalable SigMod capabilities could be utilized during various stages of operations to provide voice, video and data communications, mission command and situational awareness over the Army’s tactical communications network backbone, Warfighter Information Network-Tactical (WIN-T). Demonstration capabilities included a new high-bandwidth Terrestrial Transmission Line Of Sight (TRILOS) radio; the range-extending Troposcatter (Tropo) Lite; Commercial Coalition Equipment (CCE); and the Modular Communications Node - Advanced Enclave (MCN-AE), which supports intelligence users over the WIN-T network. All of these capabilities are commercial hardware solutions. Most mission command systems require a lot of bandwidth to operate and exchange situational awareness throughout the battlefield. To help meet these requirements, a component of this expeditionary tools set, the new TRILOS radio, provides a 12 times increase in bandwidth over the current line-of-sight capability known as the High Capacity Line Of Sight (HCLOS) radio. TRILOS is packed in a few deployable transit cases providing a significant reduction in SWaP, compared to the HCLOS radio, which requires two sheltered-vehicles and two large antennas to relay information. Additionally, not only does TRILOS provide point-to-point communications, but unlike the HCLOS, it also provides point-to-multipoint (signals to multiple locations) for increased capability, situational awareness and operational flexibility. Complementing the TRILOS, and extending network range even further, the Troposcatter (Tropo) Lite provides beyond-line-of-sight (BLOS) capability without using expensive and limited satellite resources. Soldiers can bounce (or scatter) signals off of the troposphere much like skipping a stone on pond, or they can refract signals off of objects such as mountain tops, extending signals over terrain obstructions like trees and mountains, which can inhibit LOS communication. The Tropo Lite is deployed in transit cases and is significantly smaller than the legacy Tropo systems for increased unit agility. One of the biggest advantages of Tropo Lite is that it provides lower latency than satellite systems. This low latency, long-range BLOS backhaul can be used for mission critical Command, Control, Communications, Computers, Combat Systems, Intelligence, Surveillance and Reconnaissance (C5ISR) and patriot missile fire controls, which require ultra-low latency to ensure accurate fires timing . Not only does some of the new SigMod equipment improve bandwidth and range, but it enables commercial, coalition (through CCE) and intelligence users (through MCN-AE) to connect to exchange voice, video and data information over the WIN-T network. Additionally, CCE provides a Radio Bridging Voice Cross-banding (RBVC) capability that enables radios on different frequencies, or different equipment such as radios or cell phones, to seamlessly talk to each other, which is essential in both disaster response or coalition operations where different players and organizations have their own equipment. Using the same network agnostic hardware “box” as the CCE, the MCN-AE augments the intelligence network, enabling intelligence users to simply plug into the MCN-AE enclave and, through the unit’s high-bandwidth WIN-T “pipe”, connect to all the same resources they had using the Trojan intelligence network. Additional expeditionary solutions, including 4G LTE capability, were demonstrated at the engineering facilities at Aberdeen Proving Ground, Maryland. After assessing the capabilities demonstrated at both Fort Bragg and APG, the results from the two efforts will be combined into a single report, which will be presented to the Army in April. The Army will use the report to inform its decisions on potential fielding of these capabilities to the GRF via the REF. Some of the capabilities that were demonstrated at Fort Bragg will be fielded to the Army as soon as fourth quarter fiscal year 2016. Project Manager WIN-T can deliver these capabilities sooner if Army decides to make that decision. Lt. Col. Thomas Sager, deputy commanding officer, 82nd Airborne Division, agreed that having this modular, scalable toolbox of network capabilities could provide operational flexibility in support of varying mission requirements, locations and terrain.